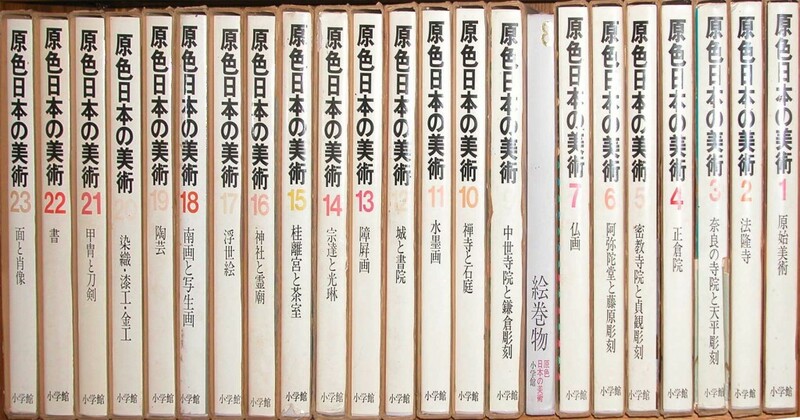 I collected the 30 volumes of Genshoku Nihon no Bjijtsu — 29 of them when I was a poor student in Tokyo from 1966. These 11″ by 14″ pages of large color photographs of Japanese cultural treasures (over a hundred in each volume) were stunning when they were first published and have held their full color integrity throughout. To read the reading, you will need to do so in Japanese. Over the intervening years I have looked at the pictures often and studied many. Right now I am “into,” as we have learned to say, early Nara Period wood sculpture (about 7th Century AD). It’s time to find them a new keeper. The books need nearly four linear feet of shelving and justify a custom built book case. I had one built into my house, so that book case stays with me in California. Last year I tracked down the last volume (actually, number 26) . I have posted the complete 30-volume collection for sale as a single “lot” on e-Bay, including description and statement of condition. If interested, you may see it here. If the selling process drags on long enough, i will post representative detail of contents on this blog.